Polemic Run Road leads off the U.S. 19 expressway and into the hills along the Little Birch River. Every day more than 10,000 motorists pass the turn off onto Polemic Run Road, but few leave the U.S. 19 expressway and wander into the high, wooded hills to the west. Those who do gain access to a world few others see. The one-lane road mounts steeply up Barnett Hill, as it has for more than 100 years, then descends the tumbling run past cemeteries and old churches and through dark groves of hemlock. 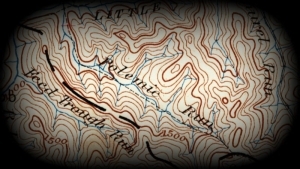 1893 may be earliest official mapping. Perhaps more interesting in the immediate sense is the name “Polemic” itself. What is “Polemic?” How is it pronounced? And why is the stream named that? I’ve driven past the road-sign since the 1970s, but only now learned anything about it. The world “polemic” isn’t used much today, but it was in the 1800s, particularly among settlers who liked to debate — a popular form of entertainment in the hills, especially where religion and politics were concerned. The mystery of Polemic Run concerns how this reasonably rare word came to describe a creek. What would have made a creek argumentative? Not more than 50 miles southward there is a Contrary Creek, but in that case the name is somewhat more obvious: the stream’s lower section runs contrary to others that feed into Keeney’s Creek, a tributary of the New River near Winona. Little about the descent or direction of the stream as it drops toward the Little Birch River seems contrary or contentious, though I could certainly be wrong in my estimation. I’ve traveled the route myself and found it exceptionally pleasant, rather. Since then, I’ve combed through local histories, asked questions of post-masters and old-timers, and Googled around as much as I felt worth my while. 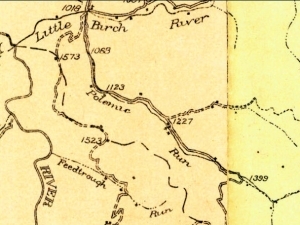 The first reference I found to the stream is from the U.S. Geologic Survey map of 1893 and a survey report published in 1917, which made only mention of the run as a tributary of the Little Birch River. A 1910 map shows a paralleling route. A 1908 map, a portion of which I’ve included here, shows two nearly parallel routes ascending to the south of Little Birch River — one following the run and the other ascending a ridge to the west, mounting in switchbacks. Could it be that early road builders argued over which route would be best to build southward? The road that followed the creek may well have been the more difficult to traverse, notably during high water in spring, while the high road might have been less muddy. Mud was an important consideration in spring when wagon roads became nearly impassable, especially after the snowmelt. Thus far, without any input from knowledgeable locals, the origin of the name may remain obscured by time, the route insignificant despite its exceptional notoriety as a result of its associated with the U.S. 19 expressway off of which it leads. 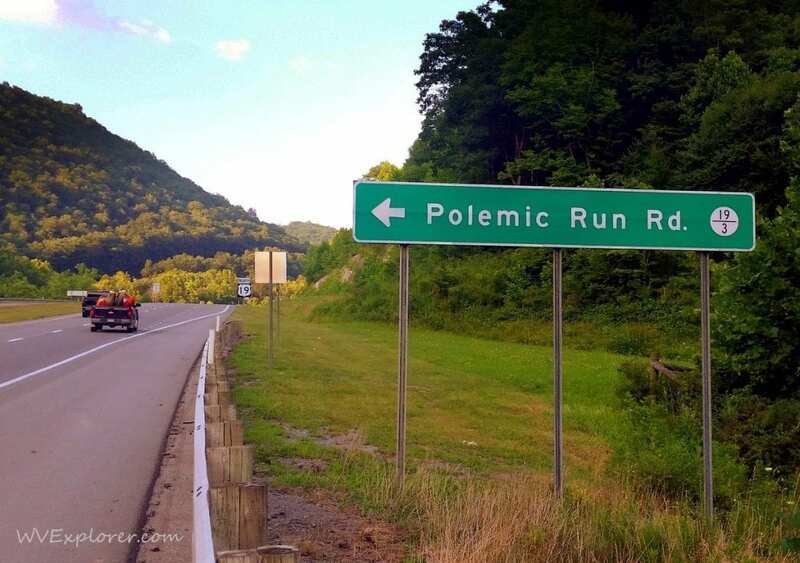 * An excursion off U.S. 19 and onto Polemic Run Road may be a welcome diversion for motorists traveling between Sutton, West Virginia, and Summersville, West Virginia. Beginning on U.S. 19 approximately one mile north of the village of Birch River, follow Polemic Run Road (rural route 19/3) approximately 1.5 miles to the summit of Barnett Hill. At the junction of Crooked Road on the left, Polemic Run Road becomes rural route 38. Continue approximately 3.7 miles to the end of Polemic Run Road at a bridge over Little Birch River. Turn right after crossing the bridge, and follow route 28 approximately 2.8 miles upstream along the Little Birch River to the U.S. 19 expressway. Next articleSave while traveling to West Virginia: How to do it!